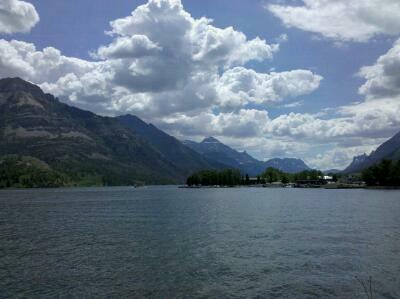 Kath and I drove north from St. Mary’s to the Waterton Lakes area in the Canadian side of the park, which is in a gorgeous setting, with a clear, off-blue lake beside a jewel of a town surrounded by snow-capped peaks. We also looked around the Many Glacier area, including a hike up to a waterfall. 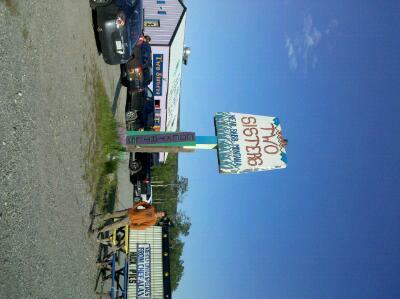 For dinner, we stopped at the Two Sisters Cafe, recommended by Mac. They make a tasty bison burger! Today, we will go explore the Two Medicine area and visit the Blackfeet Indian Days festival, which happens to start today. Two Medicine, or Medicine for Two?